As we enter the latter half of April the weather history calendar starts to reflect shift in the type of weather events we see. There are still plenty of significant snowfall events. However spring severe weather starts to appear with greater frequency including heavy rain, hail and even tornadoes. In 1885…rain changed to snow during the early morning and was the heaviest snow of the season. Total snowfall was estimated at 8.0 inches over downtown Denver…but the snow melted rapidly on the ground as it fell. However… The weight of the snow…as well as northwest winds sustained to 29 mph downed telegraph and telephone wires. Several large branches of trees were also broken by the weight of the snow. Precipitation totaled 1.01 inches from the storm. In 1887…west winds were sustained to 47 mph. In 1932…the temperature dipped to a low of only 60 degrees… The all-time record high minimum for the month. In 1988…a small tornado was observed by National Weather Service employees about 3 miles northwest of Thornton. It was on the ground for about 2 minutes. No damage was reported. Later…lightning struck two 14-year-old girls on a softball field in Westminster. One was killed…while the other suffered moderate injuries. Northwest winds gusted to 44 mph at Stapleton International Airport behind a cold front. In 2010…severe thunderstorms produced large hail… Strong winds and a tornado across parts of Adams…Arapahoe… Elbert…and Weld Counties. The hail… Up to 1.50 inches in diameter…came down so heavy along parts of I-70 and I-76 that snowplows had to be called out to remove it. Numerous vehicles were damaged by hail. In Weld County…very heavy rain and hail accompanied thunderstorm winds up to 75 mph. Hail up to 1.50 inches was reported near Bennett; 1.25 inches…5.3 miles east of Englewood; 1.0 inch size hail near Buckley Field; with 0.88 inch size hail near Boulder. A weak tornado touched down briefly in Elbert County…about 9 miles southwest of Deer Trail…but did no damage. Several minor accidents were reported with snowpacked and slick road conditions along with very low visibilities. Minor street flooding was reported in southeast Aurora. Denver International Airport recorded 0.30 inches of rainfall. Also…a peak wind gust to 36 mph from the southeast was observed at the airport. In 1910…north winds were sustained to 45 mph behind a cold front. Rainfall totaled 0.63 inch. In 1923…snowfall of 2.0 inches in the city was the only snow of the month and the last measurable snow of the season. Northwest winds were sustained to 25 mph on the 21st. In 1952…heavy snowfall totaled 7.6 inches at Stapleton Airport. The storm was accompanied by north winds gusting to 33 mph. In 2001…the second major snow storm in 11 days moved into metro Denver with blizzard conditions developing again across the plains to the northeast of Denver. Snowfall amounts ranged up to 9 inches in metro Denver with up to 23 inches in the foothills. Northwest winds were sustained at 20 to 30 mph with gusts as high as 36 mph at Denver International Airport which was again shut down for nearly an hour by power outages on the 22nd. The outages affected lighting in the concourses…train operations…de-icing and refueling operations…flight information displays…and security screenings. Navigational aids were also affected… Resulting in the cancellation of 58 arriving and departing flights which stranded about 5000 passengers. Across metro Denver storm totals included: 9 inches at Eldorado Springs; 7 inches in Boulder; 6 inches at Ken Caryl…Northglenn and near Sedalia; and 5 inches in Arvada and Morrison. Only 1.7 inches of snow were measured at the site of the former Stapleton International Airport. In the foothills snow totals included: 23 inches near Fritz Peak south of Rollinsville…17 inches near Jamestown…16 inches near Blackhawk…14 inches in Coal Creek Canyon…13 inches at Idaho Springs and near Nederland…11 inches at Aspen Springs…and 10 inches near Bergen Park. 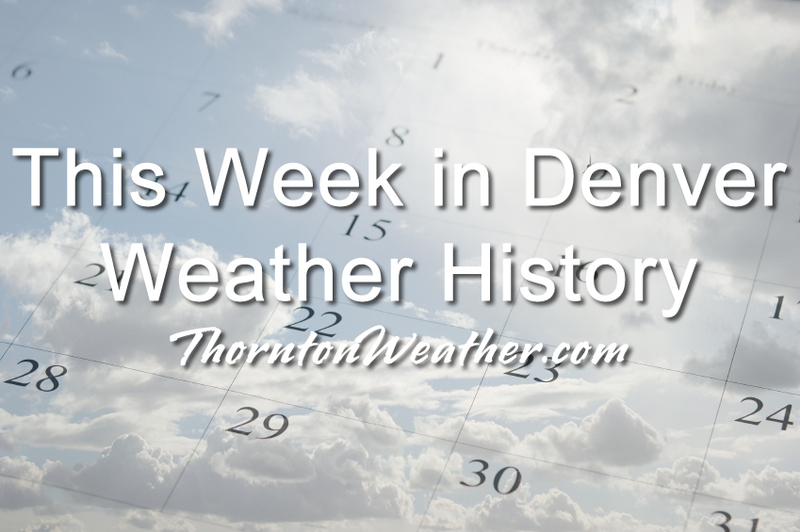 In 1999…a spring snowstorm dumped heavy snowfall over metro Denver and in the foothills. Nearly 3 feet of snow fell in the foothills with over a foot in the city. The heavy wet snow downed power lines in Douglas and Elbert counties. Scattered outages were reported at Parker…Franktown… Sedalia…and Castle Rock. Some residents were without electricity for as long as 20 hours. The inclement weather was blamed…at least in part…for several traffic accidents along the I-25 corridor between Denver and Castle Rock. Snowfall totals included: 32 inches at Idaho Springs; 31 inches on Crowhill; 29 inches near Evergreen; 26 inches at Chief Hosa and Coal Creek Canyon; 25 inches at Bailey; 24 inches at Floyd Hill; 23 inches at conifer…Genesee…Golden Gate Canyon…North Turkey Creek…and Pine Junction; 13 inches at Broomfield and near Sedalia; 12 inches in Boulder; 11 inches at Louisville and Parker; and 9 inches at the site of the former Stapleton International Airport. In 2004…heavy snow fell across metro Denver…when low level upslope conditions developed against the foothills and Palmer Divide. Snowfall totals included: 18 inches in the foothills southwest of Boulder…17 inches at Intercanyon and near conifer…10 inches near Blackhawk and Parker…9 inches at Castle Rock and near Sedalia…7 inches in Centennial… Littleton…and near Lone Tree. Elsewhere across metro Denver…snowfall generally ranged from 2 to 5 inches. Snowfall was 4.7 inches at Denver Stapleton. Northwest winds gusted to 35 mph at Denver International Airport on the 21st. This entry was posted on Sunday, April 15th, 2018 at 4:13pm MDT and is filed under Weather History. You can follow any responses to this entry through the RSS 2.0 feed. You can skip to the end and leave a response. Pinging is currently not allowed.